Relive Vader's fall to the Dark Side this Halloween with this Revenge of the Sith kids' Anakin Skywalker costume. 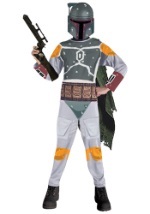 The realistic child Star Wars costume consists of a polyester tunic/shirt combo and pants with an elastic waistband, as well as boot covers attached to the pants. A polyester/foam belt is also included to tie the whole ensemble together. For an extra touch of authenticity, add any of our great Anakin and Jedi accessories to your child's costume for a great Halloween look.